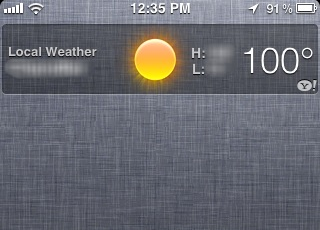 iOS: If you're using local weather settings in your weather app, your GPS will activate every time you access the app. Moreover, if you've enabled this in the native Weather app and you also have the Weather widget in the Notification Center, the Location Services icon will pop back up every time you open the Notification Center. If you want the Weather widget in the Notification Center but don't want to activate Location Services each time you open it, try manually inputting your location in the Weather app instead of setting the app to detect the local weather. This may lead to a slightly less accurate forecast (I'm not sure about this though), but will prevent the Location Services icon from popping up every time you open Notification Center, which may help save battery.